Discover How to Grow your own Garden Fresh Herbs and Use Them to Create Delicious Dishes. 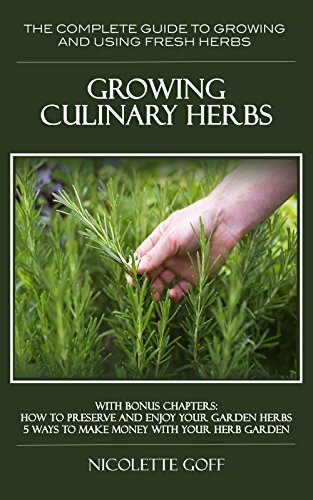 “Growing Culinary Herbs” will inspire you to start your own herb garden, regardless of where you live. Find out exactly how easy it is to grow herbs suited to your local conditions and climate, how to design your space for maximum results, and the right plants to grow in your gardens or containers.This handy book will show you a multitude of methods to grow and to use these healthy, aromatic and flavorful herbs that earn you rave reviews at mealtime. Also included are many useful planning and planting tips, along with a Plant by Plant Guide to the 21 Most Common Culinary Herbs. This comprehensive chapter includes climate zones, soil type and best growing conditions of each herb, along with photos and clear plant descriptions. Best ways to use each herb in the kitchen to enhance the natural flavors and aromas complete this invaluable reference section. If you want to know how to use culinary herbs, the first step is growing them. A fragrant and lush herb plant just outside the kitchen door is the best incentive and inspiration. Start with the herbs you already like, and branch out. Soon youâ€™ll find that herbs will become as basic to your meal preparations as salt and pepper. Still not sure how to use those herbs you grow? In the section â€œHerbs in the Kitchenâ€ discover recipes and directions for creating your own delicious herbal butters, sauces, pestos, and vinegars. Find out which herbs to add for zest and flavor in your salads. A short recipe section, including delicious recipes for including fresh herbs in your soups, main dishes, salads, and even baking gives you even more ideas on how to use these tasty, aromatic plants and lift every-day meals to taste-bud tingling heights. And in the bonus section, youâ€™ll find the complete guide to preserving your herbs for year-round enjoyment. Always wanted to grow your own herbs? This book will get you started. Scroll up and grab a copy today.